The idea to have a yearly festival in Durand to celebrate our Railroad Heritage was born in November of 1975 when the Grand Trunk Western Baggage Car was permanently placed in Iron Horse Park to serve as Durand’s Railroad History Museum. Acquiring, restoring, and outfitting the car as our Railroad History Museum was truly a community project. Since then, Durand Railroad Days has been celebrated the weekend after Mother’s day in May for the past forty years. In 1856 when the first railroad came through this area, Durand was already on its way to become a significant railroad “hub” for the State of Michigan. The Village of Durand was organized in 1887. As the story goes, 50 Italian immigrants, workers on the railroad in the area living in a string of railcars, helped bring the number of citizens to 300 enough to incorporate as a village. 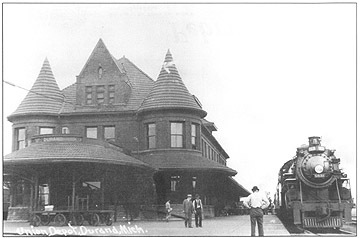 By the time the Grand Trunk Western Union Depot was built in 1905 to house the corporate needs of the Grand Trunk Railway System and the Ann Arbor Railroad, Durand had one of the busiest railroad diamonds in the State of Michigan. The Grand Trunk Roundhouse built in 1908 was one of most unique such facility in the State since it was a 360 degree roundhouse. In Durand, there is no question that the railroads came first, and that the railroads were the reason Durand exists. Given our important place in Michigan, United States and International Railroad History, it seems natural for Durand to celebrate this heritage every year. The first eight Railroad Days included a parade, a carnival, and children’s Railroad Art displays at the library, a Model Railroader Flea Market, and a ceremony honoring the Railroad Person of the Year. While the festival has grown adding many other activities, the Railroad is very much in the forefront given the main part of the festival is in Diamond District Park and Iron Horse Park along the main line railroad and rail yard in Michigan. The initial Railroad Days were sponsored by the Durand Railroad History Museum in the GTW Baggage Car in Iron Horse Park. When the festival grew and participation increased, Durand Railroad Days, Inc., a nonprofit corporation was formed in 1984 to coordinate, plan and host the festival. Selection of a Royal Court, including a Miss Railroad Days, a Princess and Prince became part of the new events in addition to the ceremony honoring a Railroad Person of the Year. Durand is still a railroad town, proud of its heritage and proud of the men and women of the railroad industry that helped build our Nation and who continue to keep it “moving” forward. Come Celebrate Railroad Days with us this year as we celebrate our 40th birthday!